outside our hotel for some camp-style רל״ש (relesh). 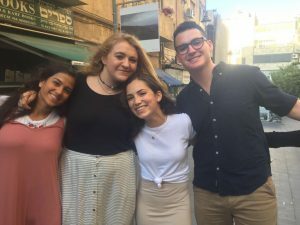 After many of the community members lingered nearby in order to soak in the songs of Shabbat, the group walked to a balcony overlooking the Kotel where they sang a beautiful and passionate קבלת שבת (Kabbalat Shabbat) that nearby tourists decided to both film and then eventually join in. Afterward, the group descended to the Kotel for some personal תפילה (prayer). It didn’t take long, however, before everyone had joined in singing and dancing circles made up of both locals and other touring groups. The group then headed back for Shabbat dinner and then to a park to close the night with some beautiful זמירות (songs). Saturday started with the group separating into groups to attend five different בתי כנסת (synagogues) – a reform synagogue, a conservative synagogue, a partnership synagogue, a traditional orthodox synagogue, and a Carlebach style mechitzah minyan. Each group experienced something new and beautiful. 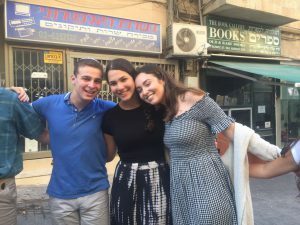 After returning for some lunch, the group had some well-deserved rest time, followed by a satirical skit titled “parsha players” and discussion about the Kotel, Women of the Wall, and other difficult topics that they had encountered over the past few days. Shabbat ended with a beautiful circle of singing in the park and a musical הבדלה (havdallah) led by our very own Saul Amkraut. The night finished with a trip to Ben Yehudah street full of food, shopping and mini reunions with old acquaintances. All your children are doing amazingly well, and are extremely thoughtful, profound and dedicated individuals, and the trip couldn’t be going better!